Nine years after Brown v. Board of Education in 1954, and only a year before the Civil Rights Act of 1964, a judge in the Forsyth County Courthouse of Winston-Salem, North Carolina, wrenched twelve-year-old Gene Cheek from the security of his mother's devotion. Here is a true story of love in a time afflicted by hatred, ignorance, and racism. At its core, this is a frank account of a love affair between a white woman and a black man that took mother from son and split a family forever. In the early 1960s, the city of Winston-Salem struggled under the strict edicts of segregation, setting the tone of division that would plague Gene Cheek's life. Raised by his alcoholic father and his earnestly loving mother, Gene learned about the power of hatred and the strength of love. Yet when his mother falls in love with Cornelius Tucker, an African-American man, and becomes pregnant with his child, their union is seen as morally and lawfully unfit, forcing the family to choose between the infant and Gene. From a distance of more than forty years, Gene Cheek recounts a life of constant struggle with his biological father. Briefly that tension dissolved with the warm guidance of Cornelius Tucker--but that would soon end. 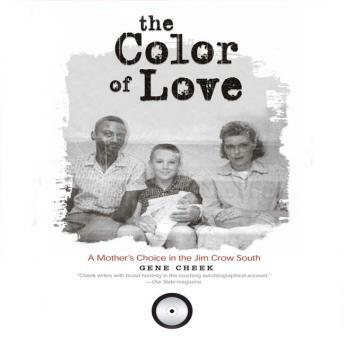 The Color of Love is Gene Cheek's story told in his singularly honest voice. Its sincerity and truth resonate with a plea for tolerance, and the irrevocable nature of the decisions and emotions of modern life. This is a powerful story of love and forgiveness in the context of racial hatred during a tumultuous time in the South. Vanessa Bush American Library Association.